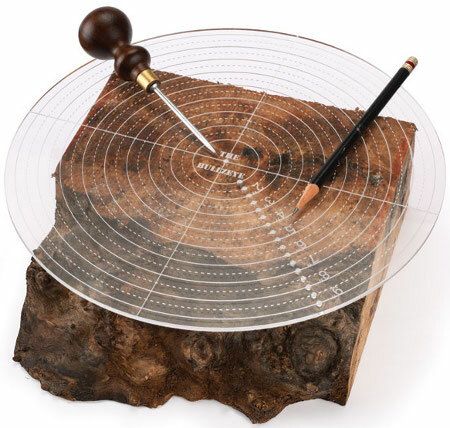 Once you’ve included the figure or features you want and excluded the ones you don’t under the circle that matches the finished diameter, just stick an awl in the center hole of the Bullzeye, pencil in the matching diameter hole, and scribe a circle. The Bullzeye Center Finder will run you $15 before shipping. I don’t do any turning but this looks like a really helpful tool. And I can really appreciate the beauty in that chunk of burl sitting there. I use dividers. The farther my tongue is stuck out, the more I’m thinking about what I’m doing.